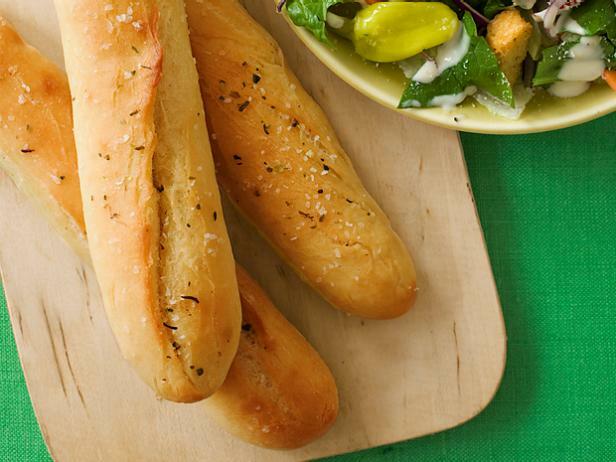 Perfect breadsticks to go with any meal. Make the dough: Place 1/4 cup warm water in the bowl of a mixer; sprinkle in the yeast and set aside until foamy, about 5 minutes. Add the flour, butter, sugar, fine salt and 1 1/4 cups plus 2 tablespoons warm water; mix with the paddle attachment until a slightly sticky dough forms, 5 minutes. Knead the dough by hand on a floured surface until very smooth and soft, 3 minutes. Roll into a 2-foot-long log; cut into 16 1 1/2-inch-long pieces. Knead each piece slightly and shape into a 7-inch-long breadstick; arrange 2 inches apart on a parchment-lined baking sheet. Cover with a cloth; let rise in a warm spot until almost doubled, about 45 minutes. Preheat the oven to 400 degrees. Make the topping: Brush the breadsticks with 1 1/2 tablespoons of the butter and sprinkle with 1/4 teaspoon kosher salt. Bake until lightly golden, about 15 minutes. Meanwhile, combine the remaining 1/4 teaspoon salt with the garlic powder and oregano. Brush the warm breadsticks with the remaining 1 1/2 tablespoons melted butter and sprinkle with the flavored salt.